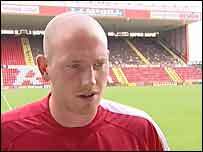 Bristol City duo Steve Brooker and Bradley Orr have returned to training after apologising to fans over the incident which led to being imprisoned. The pair were released from Leyhill Prison on Thursday morning and were driven to a meeting with chairman Steve Lansdown and vice chairman Keith Dawe. Orr and Brooker were jailed for 28 days for their part in a nightclub brawl. However, team-mate David Partridge is still in prison after receiving a two-month sentence. A fourth player, Scott Brown, was given 120 hours' community service. City captain Brooker told the club website: "I greatly regret what happened. While I think the sentence was harsh, I know I let down the club and the supporters." Midfielder Orr added: "I can't wait to put it all behind me. "The best way to make up for it is for me to give 100% on the pitch and help the team achieve promotion."